Candle warmers give scented candle lovers an alternative to burning candles. This is helpful for those who want to enjoy the scent without the risk from an open flame or the health risks from the soot. Candle warmers let you enjoy the scent of a candle without the risk of flame. Candle warmers, which slowly melt the wax and release the fragrance, eliminate the risk of having an open flame. Those who want to enjoy scented candles at the office but aren't allowed to light a flame can also benefit from a candle warmer. There are different styles of candle warmers available, but all use low wattage bulbs or plates to slowly melt the wax. Lamp warmers use a 25-watt bulb to melt from the top. Crock warmers and hot plates both melt the wax from the bottom. None of these warmers heat the wax hot enough to burn skin. The wax gets just hot enough to melt, which is only slightly above body temperature. Hot plate style warmers use as much as 40 watts to heat the candle, but lamp style warmers and crocks use only 25. Thus, hot plate warmers are hottest and can burn you if you touch the hot plate. Another risk with using a candle warmer is the wax getting spilled. Manufacturers recommend not moving the warmer when the wax is in a liquid state. 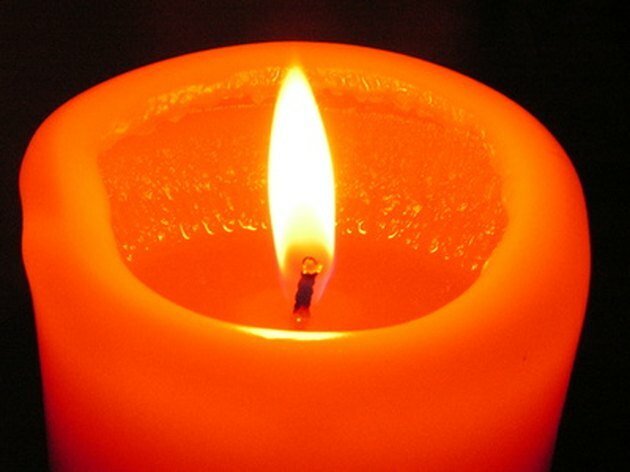 If a melted candle is spilled, the wax from soy candles is easier to clean than paraffin wax. Christine H. Sedlacek has been writing professionally since 2008. She has written on a variety of subjects, from juvenile diabetes care to choosing the right running shoe. Her work has appeared in the "Davis County Clipper" and other sources. Sedlacek earned a Bachelor of Arts in English from the University of Utah.